Add this shop to my favorites. Carte particuliere des Costes de l'Afrique No. Availability: in stock Condition : Very good, original/contemporary hand coloring. 1700 Overall size : 53 x 63 cm. Image size : 43.5 x 58 cm. 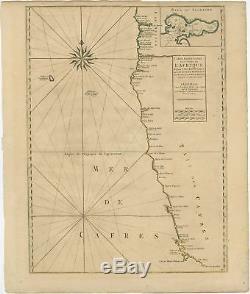 Description: Antique map titled'Carte particuliere des Costes de l'Afrique'. Map of the coasts of Namibia and South Africa. With an inset map of Saldanha Bay. Artists and Engravers: Published by H.
The item "Carte particuliere des Costes de l'Afrique (No. 1700)" is in sale since Wednesday, October 10, 2018. This item is in the category "Antiques\Maps, Atlases & Globes\Africa Maps". The seller is "bartele-gallery" and is located in Langweer. This item can be shipped worldwide.